This month at ArthurAshe.org we wanted to take an in-depth look at an important health issue in America: obesity. 127 million adult Americans, are overweight, 67 percent of the population. Almost half of those adults are obese, meaning they have excessive levels of body fat. This has serious implications for our health as a nation. Obesity is related to many diseases and is said to reduce life expectancy by six to seven years. A study by the Center for Disease Control and Prevention, released in 2004, showed that 400,000 deaths in the U.S. in 2000 (17 % of the total number of deaths) were related to “poor diet and physical inactivity.” The only factor that was found to have contributed to more deaths was tobacco. 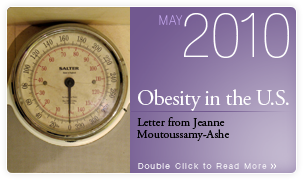 We have tried to consider this month’s topic from a few angles: We have provided information about the causes of obesity and its relationship with medical conditions, as well as the rates of prevalence for obesity in certain minority groups. We also include information about various government and political endeavors to remedy the problem as well as some simple foods that are inexpensive and healthful to improve your diet. As a society we need to start working to reverse these numbers. We need to evaluate what our media, advertising and culture says about eating. We need to examine the actual ingredients we are putting into our bodies. The easiest place to start might be the old adage you are what you eat. With emphasis on that and physical activity, we might be able to change the scales.